Root production is known to contribute at least 50% of total net primary production in dryland ecosystems, yet few studies have addressed seasonal dynamics of root production or the belowground response to altered resource availability. We aimed to identify how root production varies across three dryland ecosystems dominated by different plant functional types: the shortgrass steppe, dominated by C4 perennial bunchgrasses, the northern mixed-grass prairie, co-dominated by perennial C3 and C4 grasses, and the sagebrush steppe, dominated by a perennial shrub with an understory of C3 and C4 grasses and forbs. We also sought to determine how root production changes throughout a growing season for these three systems, and how it responds to increased water and nitrogen availability. We used root ingrowth cores to monitor root production in 6-week intervals between June 1 and October 5, 2017, and with water and nitrogen additions in shortgrass steppe, mixed-grass prairie, and sagebrush steppe in the western Great Plains of the United States. We found that the northern mixed-grass prairie had the highest total root production during our sampling period, and that seasonal patterns of root growth varied significantly across the dryland types, with root growth greatest during the middle of the growing season at the sagebrush steppe and greatest during the end of the growing season at the northern mixed-grass prairie. As expected, belowground root production was about half aboveground production in all sites. Root production responded less to water and nitrogen addition than did aboveground production. JGS conceived study, performed research, analyzed data, and wrote paper. ICB co-conceived study and co-wrote paper. WKL co-conceived study, contributed methods, and co-wrote paper. The online version of this article ( https://doi.org/10.1007/s10021-019-00364-y) contains supplementary material, which is available to authorized users. Root production responded less to water and nitrogen than did aboveground production. Over the next century, shifting climate regimes leading to unknown changes in water and nitrogen (hereafter N) availability are expected to affect dryland structure and function in the US Great Plains (Huang and others 2016; Palmquist and others 2016). Predicting how dryland ecosystems will respond to changes in resource availability is particularly important because they cover approximately 40% of the Earth’s terrestrial surface and contain substantial stores of soil carbon (Batjes 1996; White and others 2000). 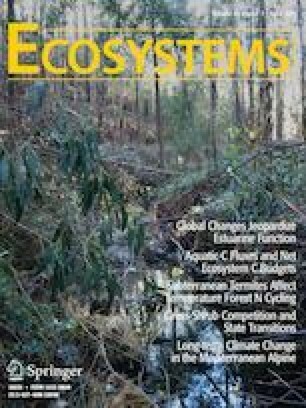 Changes in water and N availability are known to influence vegetation dynamics and aboveground net primary production (Lauenroth and others 1978; Fay and others 2003; Yahdjian and others 2011; Stevens and others 2015), altering important ecosystem processes that are linked to the carbon cycle (Wedin and Tilman 1996). In dryland ecosystems, belowground net primary production often contributes greater than 50% of total net primary production (Sims and others 1978; Milchunas and Lauenroth 2001) and at least 75% of plant biomass is belowground (Burke and others 1997a), yet relatively few studies have investigated seasonal dynamics of root production, or the belowground response to altered water and/or N availability in drylands (Peng and others 2017). Several meta-analyses have been conducted to assess global patterns in root turnover (Jackson and others 1997; Gill and Jackson 2000). These studies indicate that temperate grasslands have the highest fine root biomass per unit area of any ecosystem in the world and among the highest fine root turnover rates and that spatial patterns in root turnover are strongly influenced by mean annual temperature, while interannual temporal patterns in single grassland are strongly correlated with annual precipitation. In a study of phenology of roots compared with shoots for monoculture-grown shrubs and grasses in Canada (Steinaker and others 2010), researchers found that root production was in general most closely related to soil temperature. Despite the importance of seasonal and pulse-oriented controls over ecosystem processes in drylands (for example, Austin and others 2004), we know very little about the seasonal dynamics of root production—the key carbon input—for drylands (Gill and others 2002). Together water and N are the most frequent limiting resources for net primary production in drylands (Lauenroth and others 1978; Hooper and Johnson 1999). Regional analyses and field experiments have linked aboveground net primary production to mean annual precipitation (water availability) and N availability (Lauenroth 1979; Sala and others 1988; Milchunas and Lauenroth 1993; Epstein and others 1998b) and have revealed that with increasing mean annual precipitation, the frequency of water limitation decreases, while the frequency of N limitation increases (Yahdjian and others 2011). Net primary production is highly variable across spatial and temporal scales and depends largely on climate patterns and soil characteristics that determine important ecosystem processes including soil water residence time and N mobility (Power and Alessi 1971; Sala and others 1992; Austin and others 2004). An analysis of aboveground net primary production patterns in the central grassland region of the United States revealed that regional scale differences can be explained by mean annual precipitation, while most of the within-site variability could be explained by annual precipitation, soil water holding capacity, and their interaction (Sala and others 1988; Lauenroth and Sala 1992). However, there is a high degree of spatial and temporal covariance between water and N availability (Burke and others 1997b). Interannual variability is high in aboveground and belowground net primary production (Power and Alessi 1971; Hayes and Seastedt 1987; Liu and Greaver 2010) and can often be as large as a twofold difference. The magnitude of ecosystem response to altered resource availability both regionally and annually is highly site specific (Sala and others 1988; McCulley and others 2005). Understanding how plant functional types respond to changes in resource availability is an important component of predicting large-scale shifts in ecosystem structure and function (Epstein and others 1997). Grasses and shrubs are the most frequent dominant plant functional types in dryland ecosystems and have different spatial root patterns that determine their ability to acquire belowground resources (Walter 1971; Sala and others 1989; Lee and Lauenroth 1994). Grasses acquire the majority of their water and nutrients from upper soil layers and typically have a higher concentration of N in aboveground biomass, and a lower N residence time than shrubs, which may partially explain why grasses and shrubs respond differently to increased water and N additions (Sala and others 2012; Yahdjian and others 2014). Cool-season (C3) and warm-season (C4) grasses tend to have distinctive dynamics in resource use and uptake, as well (Epstein and others 1998a). How does root production vary across three dryland ecosystem types in the Great Plains of North America? What are the intra-seasonal dynamics of root production and do they differ among three ecosystem types? How does increased water and N availability affect the intra-seasonal dynamics of root production in our three ecosystem types? We conducted this study within three semiarid ecosystem types in the western Great Plains of the United States: the shortgrass steppe, the northern mixed-grass prairie, and the sagebrush steppe. We chose a representative site within each ecosystem type and set up three replicate plots at each site. All three sites were located on level uplands, have a history of moderate cattle grazing during the growing season, and are currently managed for this purpose. We excluded livestock during the experiment using fenced exclosures. The Central Plains Experimental Range (CPER) in the shortgrass steppe is located 61 km northeast of Fort Collins, Colorado (40°49′N, 104°43′W), at an average elevation of 1650 m. CPER is overseen by the United States Department of Agriculture’s (USDA) Agricultural Research Service (ARS) and was formerly a National Science Foundation Long-Term Ecological Research site (Lauenroth and Burke 2008). Mean annual temperature is 8.7°C and mean monthly temperatures range from − 9.8°C in December to 30.7°C in July (Figure 1A). Mean annual precipitation is 341 mm (PRISM Climate Group 2018) and approximately 75% of the annual precipitation falls between April and September (Pielke and Doesken 2008). The plant community is dominated by the short-statured C4 perennial bunchgrasses blue grama (Bouteloua gracilis) and buffalo grass (Bouteloua dactyloides). The subshrub prairie sagewort (Artemisia frigida) and plains pricklypear (Opuntia polyacantha) are present across the landscape, and bare ground patches are common (Lauenroth 2008) (nomenclature follows USDA, NRCS 2018). Climate data for the shortgrass steppe, northern mixed-grass prairie, and sagebrush steppe sites. The bars represent long-term monthly precipitation averages (1981–2010) generated from PRISM (PRISM Climate Group 2018). The light-blue line is the monthly precipitation from October 2016 to September 2017 and the red dotted line is the average monthly temperature from October 2016 to September 2017. The northern mixed-grass prairie site is located in the High Plains Grasslands Research Station (HPGRS) and overseen by the USDA-ARS. The site is located 7 km northwest of Cheyenne, Wyoming (41°12′N, 104°54′W), and has an average elevation of 1930 m. Mean annual temperature is 7.4°C and mean monthly temperatures range from − 8.8°C in December to 27.9°C in July (Figure 1B). Mean annual precipitation is 393 mm (PRISM Climate Group 2018). The vegetation at HPGRS is composed of a mixture of C3 and C4 perennial grass species including western wheatgrass (Pascopyrum smithii), needle and thread (Hesperostipa comata), and B. gracilis. C3 forbs and the subshrub, prairie sagewort (Artemisia frigida) are also common across the landscape (Derner and others 2008). The sagebrush steppe site is within the boundaries of the Thunder Basin National Grassland (TBNG). Our site was located on an inholding owned by The Nature Conservancy. The site is located 64 km northeast of Douglas, Wyoming (43°25′N, 104°56′W), and has an average elevation of 1500 m. Mean annual temperature is 8.1°C and mean monthly temperatures range from − 11.1°C in December to 31.7°C in July. Mean annual precipitation is 331 mm (Figure 1C) (PRISM Climate Group 2018). Big sagebrush (Artemisia tridentata) is the dominant shrub and the understory is a mixture of C3 and C4 grasses and forbs, including B. gracilis, H. comata, and P. smithii (Pennington and others 2019) and plains pricklypear (Opuntia polyacantha). Each site consisted of three exclosures (14.5 m × 14.5 m) that were equally spaced across the landscape. The vegetation within the exclosures had similar plant community structure, ground cover, and sandy loam or loam soils (Swindon and others 2019). Within each exclosure, we established four subplots (3 m × 3 m) separated by a 6 m buffer. Each subplot was randomly assigned a treatment: control, water, N, or water plus N. We dissolved N in the form of urea (CH4N2O) with water and applied it one time between June 1 and 3 2017, at 100 kg N/ha, about 5–10 times the annual flux of net N mineralization (Burke and others 2008; Korfanta and others 2015). For the water and water plus N treatments, we increased the average monthly precipitation for each site by 40% based on NOAA’s Climate Normals (Arguez and others 2010) from the nearest climate station to ensure that a “higher than average” amount of water was added to the treatments (Online Appendix 1); the plots received 76 mm (shortgrass steppe), 82 mm (northern mixed-grass prairie), and 56 mm (sagebrush steppe). The subplots received water application once at the beginning of each month starting on the first week of June 2017 and ending in the first week of September 2017. To estimate root production, we used the root ingrowth method (Vogt and others 1998; McCulley and others 2005; Byrne and others 2013). We created 5 cm diameter ingrowth screens that were 20 cm long using 2-mm-fiberglass mesh screen, which allows for fine root growth (Montagnoli and others 2014). We produced a total of 756 ingrowth screens and placed 21 ingrowth cores per treatment per exclosure at each site, for a total of 63 cores per treatment per site. To place each ingrowth core into the ground, we used a 5 cm diameter hole saw attached to a hand drill and drilled to a depth of 20 cm. We placed the ingrowth cores in the first week of June, systematically and equally spaced within each subplot to equalize disturbance to each core from the placement of nearby cores. At each plot, we combined the extracted soil and sieved it twice with a 5-mm screen to remove live and dead root biomass. We placed the ingrowth screens into the holes and filled them with the root-free soil. To account for bulk density at each site, we used a field scale to measure the mass of soil per core and compressed the soil manually (Van Haveren and Galbraith 1971; Abdel-Magid and others 1987; Gasch and others 2016). To estimate intra-seasonal root production, we extracted a random set of one-third of the cores every 6 weeks starting on July 14, with the final set extracted at week eighteen on October 5, with the overall time period designed to match the period that has been shown to capture the majority of seasonal root growth (Hayes and Seastedt 1987; Sindhoj and others 2000). To understand how treatments may have impacted aboveground net primary production, we sampled aboveground biomass at the end of the growing season between October 1 and 8 as an estimate of production (Lauenroth and others 1986); we chose these dates to correspond with the last root production estimate, and because comparisons across sites for the aboveground production were not a key question for this study. We randomly placed five 20 × 50 cm quadrats inside each treatment subplot and clipped the aboveground biomass of all species except woody shrubs such as Artemisia tridentata, because of the difficulty of estimating current year’s growth. We separated the aboveground biomass into grasses and forbs, cacti, and Artemisia frigida, because they represented the important plant functional types. We chose to exclude cacti from this analysis, because our quadrats were too small to obtain a useful biomass estimate. We air-dried the samples for at least 72 h and converted aboveground biomass to grams per meter squared (g m−2). Our estimate of aboveground production is likely an underestimate because of dried leaves that may have blown away after they senesced and before we sampled, and because we did not include an estimate of aboveground production for woody shrubs. The underestimate was probably largest for the sagebrush site, for this reason; still the method we used should capture treatment effects on all grasses, forbs, and the subshrub Artemisia frigida. We air-dried the root ingrowth cores for 72 h and washed the soil from the belowground biomass using the methods of Lauenroth and Whitman (1971). We dried the biomass at 55°C for 48 h, separated the roots from the remaining organic material by hand, and weighed the roots. To eliminate contamination of residual soil particles, we ashed the samples in a muffle furnace at 450°C for 4 h (Harmon and others 1999). We used the ash-free dry weight to calculate grams of dry biomass per meter squared (g m−2). Our experiment used a split-plot design; the water and N treatments were the subplot level, and time was the sub-subplot level. This design allowed us to calculate error terms for each level that resulted from the experimental design, assuming that different treatments were assigned randomly to sampling units at different scales. We used the diagwl function within the agricolae package in R (R Core Team 2018) to conduct the split-plot analysis and tested for the effect of site, treatment, time, and their interaction on root production, for each of our three study questions. We then conducted least squares mean separation tests to identify which means were statistically different from each other. To test for treatment effects on aboveground production of grasses, forbs, and A. frigida, we used a one-way analysis of variance followed by Tukey’s HSD for each site. To evaluate the seasonal dynamics, we conducted two analyses. First, we compared the incremental values (total biomass in cores per site per treatment per time frame) for 0–6, 0–12, and 0–18 weeks, to determine whether there was a significant difference among time frames; if not, it means that no production occurred during the subsequent time frame. Next, we calculated the difference between time frames to estimate production for the 6–12 and 12–18 week periods. We did this by subtracting the mean production of 0–6 weeks from 0 to 12 weeks and subtracting the mean production of 6–12 weeks from 0 to 18 weeks. Across the three sites, mean annual temperature in 2016–2017 was consistent with long-term averages, deviating no more than 0.5°C from the annual average. Throughout the experiment, both the total amount and seasonal distribution of growing season precipitation varied substantially from long-term climate normals (PRISM Climate Group 2018) (Figure 1). Water-year precipitation from October 2016 through September 2017 was higher than the long-term averages (PRISM Climate Group 2018) at all our sites. At the shortgrass steppe site, the highest percentage of precipitation fell in the early growing season months of April and May 2017 and was followed by an unusually dry June, receiving only 10 mm of precipitation as compared to the long-term average of 51 mm (Figure 1A). Long-term mean water-year precipitation is 367 mm at the northern mixed-grass prairie site and during our study, the site received approximately 372 mm (Figure 1B). April and May 2017 received on average 30 mm more precipitation than the long-term average and this site also experienced an unusually dry June (a difference of 57 mm from the long-term average). At the sagebrush steppe, the long-term water-year precipitation is 396 mm and the site received 331 mm in 2016–2017, a difference of 65 mm (Figure 1C). Mean precipitation in August 2017 was particularly high for this site, receiving 27 mm more precipitation than the long-term average. Root production of the control plots after 18 weeks was not significantly different between the shortgrass steppe site (92 g m−2) and northern mixed-grass prairie site (113 g m−2), but was significantly lower at the sagebrush steppe site (32 g m−2) than the other two sites (Table 1, Figure 2). At the shortgrass steppe site, the rate of root production was relatively constant throughout the growing season across all treatments. The rate of root production at the northern mixed-grass prairie site increased with time during the growing season, corresponding with patterns of precipitation (Figure 1B), with the highest production in the final 6-week period. This trend was consistent across all treatments except the N treatment. At the sagebrush steppe, root production peaked during the second 6-week interval across all treatments; between the second and third 6-week interval, there was no additional root production for the control, N, and water treatments. 0–6 is a 6-week interval from June 1 to July 14, 6–12 is from July 14 to August 24, and 12–18 is from August 24 to October 5. Differences through time and across sites, within treatments, are demonstrated with small letters (0–6, 0–12, 0–18 weeks), and with capital letters to show whether the incremental growth per 6-week period differed through the season (0–6, 6–12, 12–18 weeks). Differences among treatments (columns) only occurred for the 0–18 period for the northern mixed-grass prairie (denoted by numbers). Root production throughout 18 weeks across sites representing three dryland ecosystem types—the shortgrass steppe (A), the northern mixed-grass prairie (B) and the sagebrush steppe (C). All sites received the same treatment regime and each line represents a treatment: control (c), nitrogen (n), water (w), and water plus nitrogen (wn). Significant differences in root production across treatments within sites are labeled with an asterisk (*). Root production was highly variable at all sites throughout the season (Table 1). As a consequence, though we found a trend of increased root production with water and water plus N additions for all sites, there were few statistically significant differences. Both the shortgrass steppe and the mixed-grass prairie demonstrated trends of higher root production in both water treatments during the 0–6, 0–12, and 0–18 week intervals than the control or N treatments. 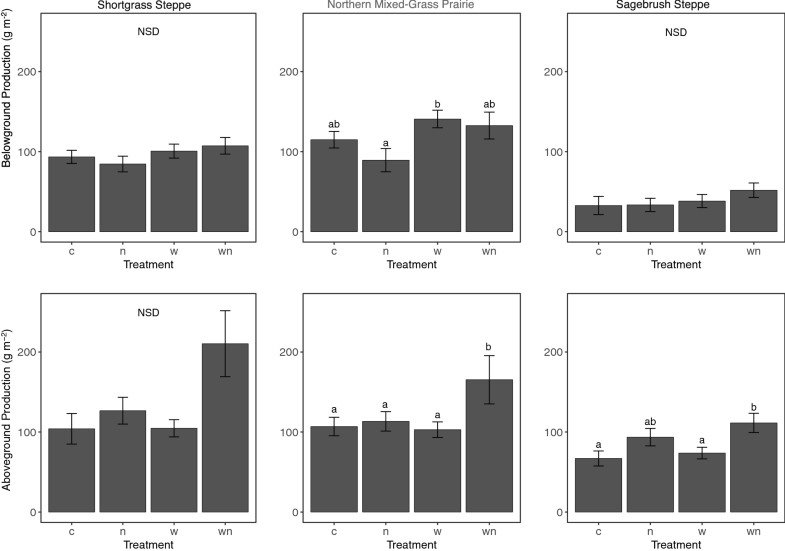 At the northern mixed-grass prairie site, there was significantly higher production in the water plus N treatment than in the N treatment (Figure 2B). Similar to root production, the combined aboveground biomass of the dominant plant functional types, grasses, forbs, and A. frigida of the control plots was significantly lower at the sagebrush steppe site (67 g m−2) than at the shortgrass steppe (105 g m−2) or the northern mixed-grass prairie sites (107 g m−2) (Figure 3). 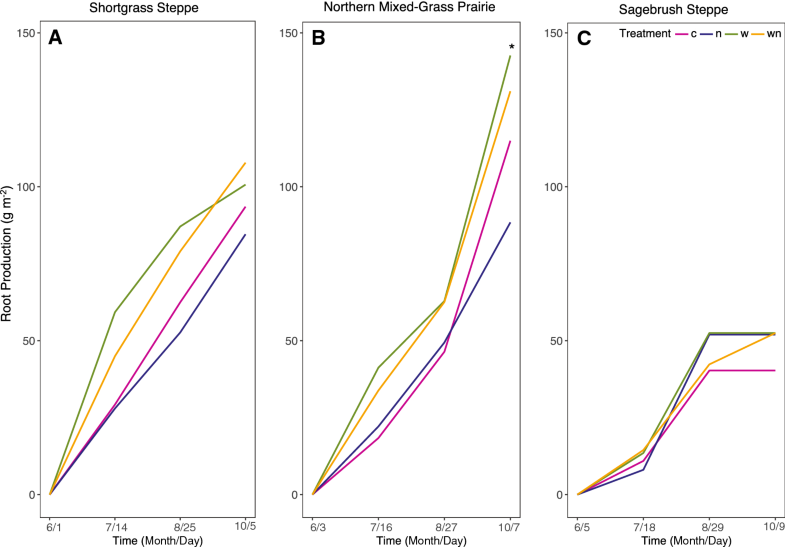 Aboveground biomass in the water plus N treatment was higher than any of the other treatments at all three sites, but the difference was only significant at the northern mixed-grass prairie and sagebrush steppe sites. Belowground and aboveground production (non-shrub) after 18 weeks between June 1 and October 5, 2017, by site (shortgrass steppe, northern mixed-grass prairie, and sagebrush steppe) and treatment (control-c; nitrogen-n; water-w; water + nitrogen-wn). The letters (a or b) represent statistically different means (p < 0.05) and the bars represent standard error of the mean; NSD connotes no significant differences among treatment means within sites. Across the three ecosystem types, root production and aboveground production were highest at the northern mixed-grass prairie site and lowest at the sagebrush steppe site, following the trends in annual precipitation. Seasonal trends in root production also matched precipitation at each site. The rate of root production was approximately constant throughout the growing season at the shortgrass steppe site, greatest during the end of the growing season at the northern mixed-grass prairie, and greatest during the middle of the growing season at the sagebrush steppe; all of these trends match the seasonal trends in precipitation. Finally, additions of water, but not nitrogen (alone), led to trends of higher aboveground and belowground production. 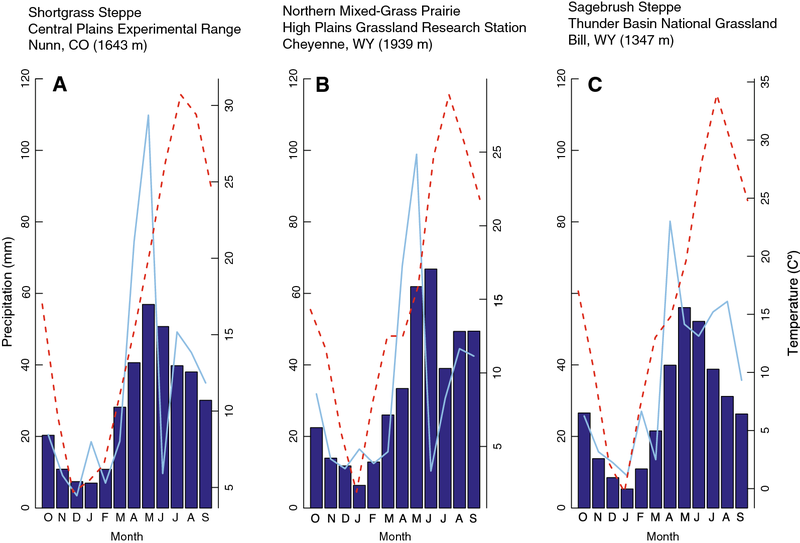 Root production over the growing season (June–September) was significantly higher at the shortgrass steppe and the northern mixed-grass prairie sites than at the sagebrush steppe site, following patterns in annual precipitation. Although Gill and Jackson (2000) and Steinaker and others (2010) suggested that root turnover increases with temperature, these three sites did not vary significantly from one another with respect to temperature. Aboveground biomass of grasses and forbs was also lowest at the sagebrush steppe and consistent with our estimates of root production. Grasses and forbs are shallow-rooted, with approximately 75% of their total root biomass in the top 20 cm of soil (Leetham and Milchunas 1985), while shrubs typically have deeper root systems to access deep water stores (Walter 1971). The sagebrush steppe is dominated by the shrub, Artemisia tridentata, and the understory consists of C3 and C4 grasses, forbs, and cacti. Bare ground can be as high as 40% of ground cover (Pennington and others 2019) as compared to the northern mixed-grass prairie with an average of 7% (Derner and others 2008) and approximately 20–40% at the shortgrass steppe (Hook and others 1994). Lower precipitation, lower aboveground biomass, shrubs with deeper roots dominating over grasses, and a high percentage of bare ground at the sagebrush steppe are the most likely explanations for why we found significantly lower root production at the site. We only sampled to 20 cm depth and therefore, we were most likely to capture root growth from shallow-rooted species, limiting our ability to assess if this trend is consistent for deep-rooted plant functional types. The Central Plains Experimental Range has been a focus for research into belowground net primary production (Milchunas and Lauenroth 2001; McCulley and others 2005; Milchunas and others 2005; Milchunas 2009). Estimates have been made by a wide variety of methods and range from 65 to 1107 g m−2 y−1 (Milchunas 2009). McCulley and others (2005) estimated root production for 2 years from May to October using the ingrowth method and reported approximately 200 g m−2 y−1 in each year. Milchunas and others (2005) used a variant of the ingrowth method over 4 years and reported an average root production of 93 g m−2 y−1 and a range of 52 to 113 g m−2 y−1. Our estimate of 93 g m−2 y−1 for the control treatment is comparable to these other root ingrowth methods, but low relative to minirhizotron, pulse-isotope dilution, or turnover methods (Milchunas 2009). The difference between our result and that of McCulley and others (2005) suggests that the month of May is an important time for root growth in the shortgrass steppe. Seasonal patterns in root production varied significantly across the three ecosystem types. The rate of root production at the shortgrass steppe site was nearly constant for all treatments throughout the growing season. The site is dominated by the C4 perennial grass Bouteloua gracilis, a species that is well adapted to warm and dry environments and covers approximately 90% of the surface (Milchunas and others 1989). B. gracilis allocates 75% or more of its total biomass belowground and extends roots horizontally below the soil surface to access quickly evaporating water stores that are a result of frequent, small rainfall events (< 5 mm) that occur throughout the growing season (Sala and Lauenroth 1985; Hook and Lauenroth 1994). The rate of root production was greatest during the late part of the growing season for all treatments at the northern mixed-grass prairie site (August 24–October 5). The northern mixed-grass prairie is a mixture of C3 and C4 species; C3 grasses are most active aboveground when the average temperatures are cool, and C4 grasses are most active aboveground when temperatures are warm (Epstein and others 1997). Our results suggest that C3 root production increased between late August and October, likely because temperatures began to cool and the C3 species increased their photosynthetic activity, and possibly because it had been very dry earlier in the growing season. Our study began on June 1, which may have missed the early growing period for C3 grasses, explaining why we did not see the same trend in the early part of the growing season (June 1–July 14). Our results did not correspond with those of Steinaker and others (2010), who found that in monocultures at a single site in Canada that C3 species stopped producing by September, whereas the C4 species Bouteloua gracilis increased root production late in the summer. We could not assess whether their finding of a lag in roots behind aboveground production occurred, because we only sampled aboveground production at the end of the season. In our study, the rate of root production was greatest during the middle of the growing season (July 14 to August 24) for all treatments at the sagebrush steppe site, likely because there was above average rainfall during this time (Figure 1). Typically, the sagebrush steppe experiences dry conditions in July and August; however, in the 2016–2017 growing season, the sagebrush steppe site received 16 mm more precipitation in July than the average year and 27 mm more in August, which may have been enough for an increase in water to allow for root production. In the late part of the growing season at the sagebrush steppe, no additional root production occurred in the control, water, and N treatment, whereas the water and N treatment still had root growth. This may suggest that environmental conditions were too hot and dry for any additional root production to occur except in the water and N treatment. There have recently been a number of review papers synthesizing the effects of water and N on root growth, but they vary substantially in their conclusions. In a global analysis of root production along natural gradients in N and P, Yuan and Chen (2012) found that fine root production increases with N and conclude that increases in N availability globally are likely to result in higher fine root production. Peng and others (2017) and Peng and Yang (2016), however, evaluated data sets of experimental manipulations of N and the resulting impacts on root production and root/shoot ratios under N enrichment and found an overall pattern of decreasing root/shoot ratio with N addition for grasslands as well as forests, wetlands, and tundra. There is a very high variability in the data they report for ecosystems with less than 1000 mm annual precipitation. Finally, other authors (Li and others 2011; Gao and others 2011) found in water and N addition experiments in Inner Mongolia that root production increased under water additions and decreased under N additions. Baer and Blair (2008) found no root biomass response to enriched N in a long-term study, but Fornara and others (2013) found in a 19-year-old fertilization experiment on grasslands that root biomass increased under the long-term N fertilization. Experiments in Patagonia (Reyes and Aguiar 2017a, b) found different responses in the two separate works: no root biomass to added N and large responses that did not appear until after 6 months. Byrne and others (2013) manipulated precipitation from shortgrass steppe and mixed-grass prairie sites both by removing and adding water and found inconsistent responses of root production among years and sites. Our results do not necessarily clarify the picture for predicting root responses to water and N in semiarid drylands. Responses to water were consistent but not significant. Mean annual precipitation in 2016–2017 at all sites was greater than the long-term average, and its seasonality varied from the long-term pattern. As a result, the control plots at all of our sites may not have been as water limited as usual, and the effect of water additions were not as large as we had expected, partially explaining why we found no significant differences between the control plots and the water treatment plots (Figure 2). With increased water availability, N limitation generally increases (Yahdjian and others 2011), but we did not see an indication that water responses were different than water plus N. Previous N addition studies in grassland ecosystems have found that N treatment effects may take at least a year to be visible (Lauenroth and others 1978; Jacobsen and others 1996), which could explain we did not see an increase in root production in the N treatment despite having an unusually high precipitation year. Alternatively, N-alone additions could have resulted in slight decreased allocation to roots, visible though only significant for the mixed-grass prairie, as a result of allometric adjustments (Peng and Yang 2016) to favor aboveground biomass production, as seen in the aboveground biomass results (Figure 3). The addition of water and N combined increased root production and aboveground production at all three sites, but the effect was not significant for root production and was only significant compared to the control for aboveground biomass at the northern mixed-grass prairie and sagebrush steppe sites. Our results indicate that responses to N in the Great Plains are site- and time-specific, and that when both water and N availability increase, plants in these ecosystems respond by increasing aboveground production more than belowground production. The realm of inference of our study is limited by the seasons during which we added water and N, the seasons during which we sampled, and the length of the overall study (one growing season). It is possible that we could have seen different root production responses had we extended our study into the early spring and later fall, and for more years. Our study was the first that we know of to examine the seasonal dynamics of root production across a range of dryland ecosystems, and our results suggest that patterns may be explained both by precipitation and plant functional-type dominance. Aboveground responses to addition of water in combination with N were stronger than belowground responses. Future changes in water availability are more likely to influence belowground production than in N deposition. PRISM Climate Group. 2018. 30 Year Normals 1981–2010. Oregon State University. Available at: http://prism.oregonstate.edu/. R Core Team. 2018. R: a language and environment for statistical computing [Internet]. Vienna, Austria: R Foundation for Statistical Computing. Available from: https://www.Rproject.org/.